Back in 2006, people started offering to pay me to perform at their events. That’s when I knew I was ready. 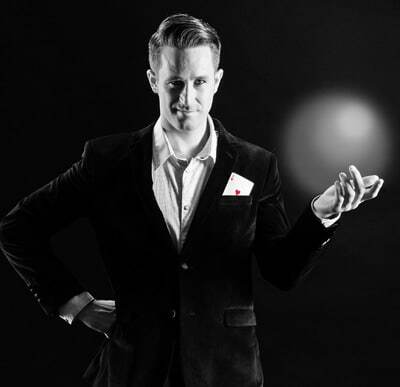 I banged together a website, and strategically bought www.PerthMagician.com and www.PerthMagician.com.au. After all, I live in Perth. And the market was indicating that perhaps I could now call myself a “magician”. There was also a very deliberate strategic reason for buying those domains – they help with organic search listings. Not long after this, I was first page Google. And proud to have achieved this, without having blown any money on Google AdWords. You know AdWords? Those annoying ads you see when you type a search into Google? That’s AdWords. Basically, the more you’re willing to spend for someone to click your ad, the more prominently your ad will feature. Perhaps not surprisingly, colleagues and competitors soon noticed my position in Google. Some asked how I’d done this, some didn’t. One asked for permission to buy an identical domain, simply with the words switched around. Not wanting to seem petty, I said sure. So, now when you type “Perth Magicians” (or some derivative of that) into Google, you will find at least three or four different magicians using derivatives of this URL, or now incorporating “Perth” into their URLs. Which in some ways is all well and good. After all, it’s a free market out there, and everyone is competing for the precious space of first page Google. It’s my belief that this behaviour, which led to a multitude of similar URLs, is not without problems. And, I believe, not without harm. Most notably, it detracts from individual brands. It lends to the idea that magicians are all one and the same, and that we are simply a commodity. Each magician doing the same thing, with the same level of quality, for a similar price. Which, my friends, is simply not the case. Nor should it be. All products, industries, and services, have their different price bands, levels of quality and service, and target markets. My core business involves performing engaging close-up and/or stage magic within Western Australia, at both corporate and non-corporate events. My non-corporate clients are middle to upper socio economic individuals. And my prices reflect this. And I believe my client list, repeat business, and many testimonials validate this positioning. So, having mulled over this “magician as a commodity” issue for some time, I decided I didn’t like it. I decided I no longer wanted to appear in Google as just another “www.perthmagician…”. So, I took steps to change it. There’s no way in hell David Copperfield would have a domain name like “www.LasVegasMagician.com”!! (Speaking of which – I see that domain name is surprisingly for sale). I am not just another magician. I am a brand (or striving to be one). And that brand is “Robbie T“. I don’t want my clients and prospective clients to say “I need a magician”. I want them to say with confidence and certainty, “I need Robbie T”. Nor do I solely perform in Perth anymore. Some of my highest paid bookings have been in Mackay (QLD), Surfers Paradise (QLD), as well as some of the most remote WA mine sites you can find. So, to address this recent insight and dilemma, I purchased www.RobbieT.com.au, and I changed my email to Robbie@RobbieT.com.au. Having a small degree of business acumen (at least I’d like to think so), I still of course own my original domain names. And they all still work, they just simply re-direct to my new domain www.RobbieT.com.au. Around ten domains in total, each going to the same place! Similarly, any emails sent to my old email address Robbie@PerthMagician.com.au will also still be received. Business continuity is key. I’m told by my web gurus that my Google listing should still remain prominent, and gosh darn it, I certainly hope so! That said, decisions like this are not without risk. There can sometimes be lags with things, and there could be some disturbances to the status quo, though likely only temporary. So, why am I sharing all of this? In part to give you an insight into the individual behind the brand – not just a magician, but also businessman, an occasional worrier, an over analyser. In my business, and indeed all businesses, one must strive to stay ahead of the competition. One must aspire to be different. To do things better. To push, adapt, grow. And this is what I plan to keep doing. This is why I am always chipping away at my business to make it better. And this is why I’m always researching and/or working at new routines, or finding ways to improve existing ones. I am no longer PerthMagician. Nay. I am Robbie T.
September 10th, 2015 | Comments Off on Increase the Impact at a Cocktail Function!